This morning, Facebook — keeper of our collective if incomplete memories — informed me that exactly one year ago today I officially took the reins as Reviews Editor for Necessary Fiction. Back in 2012 they published my story The Worst Girl’s Best Day, followed by two book reviews. Editor Steve Himmer helped me sculpt my story into what I’d intended from the beginning. When Michelle Bailat-Jones decided to move from Reviews Editor to her current position as Translations Editor, I came on board. I’d enjoyed working with both of them and knew them to be nice people and excellent editors. I was thrilled and honored to join them. Each Monday we publish a review of a recent book from an independent press. There are outstanding works of fiction included here: novels and novellas and collections and forms that defy easy categorization by authors from all over the world. They are inventive, risky, ambitious. They are obsessed with language or big questions or both. Every week of this past year I heard from publishers, publicists, and authors with news of books forthcoming. My own debut novel was published last month by a small press: Twisted Road Publications. It was a remarkable experience, preparing for my book’s publication (for the first time, seeing it from the inside), while editing reviews to help introduce other small press books. As someone who was once mostly concerned with “big pubs” and high-profile titles backed by national media campaigns (as a Book Buyer for the wholesaler Baker & Taylor), what I saw and learned this year was enlightening and empowering. If you’re like me, you try to be a good “literary citizen” but it never feels like enough. Sure, I give time to Necessary Fiction and the journal escarp. I buy small press books from the publisher (usually). I live way out in the Atlanta ‘burbs but I go into town for (some) readings. I’ve written reviews, not nearly enough. I try to share other writers’ good news on social media. But so much is missed. So much isn’t done. We have our own writing to nurture, after all, not to mention careers and families. This morning, after the latest review went live at Necessary Fiction, I listened to Episode 3 of the Citizen Lit podcast, which states an intention to explore “what it means to be an active member of the writing world.” This week’s episode features poet and Sundress Academy for the Arts (SAFTA) founder Erin Elizabeth Smith. Host Jim Warner describes her as someone who “is a builder of community and epitomizes the term literary citizen.” A lot of you probably already know Erin but I just met her last month, when I read from Not On Fire, Only Dying as part of the SAFTA Reading Series. I knew of her involvement with Sundress and Firefly Farms but did not fully understand the number of irons she has in the literary fire. I enjoyed listening to her discuss, among other things, how she creates opportunities and spaces where writers can learn, get work done alone, or share it with others. Give the episode a listen and then subscribe to the Citizen Lit podcast. (In Episode 1, you’ll hear me read a small excerpt from my novel.) Consider donating to SAFTA’s “Jayne for President” campaign, raising funds needed for a barn at Firefly Farms. 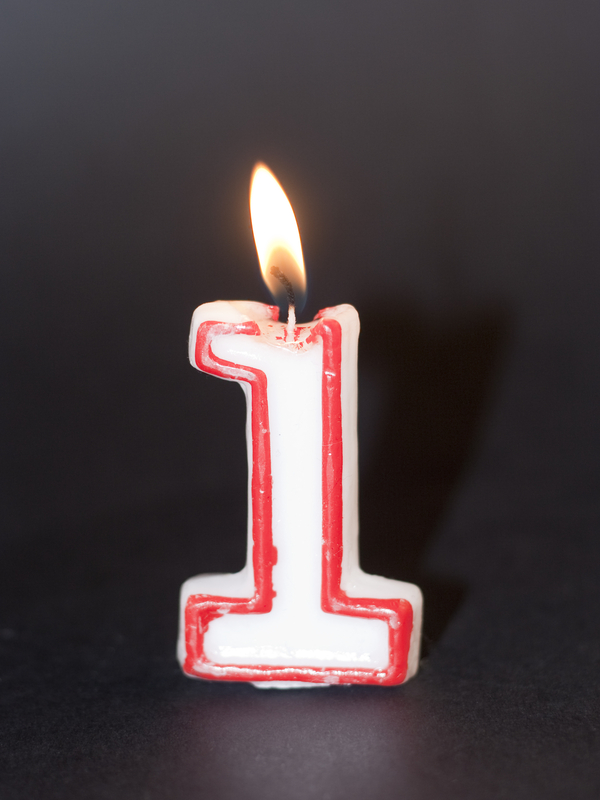 As I celebrate one year as a slightly more active literary citizen, I’m reminded that there is always more we can do to support this community of upstarts and artists and writers who are readers. It’s not just the right thing to do, it is necessary. But is it art? On book reviews. 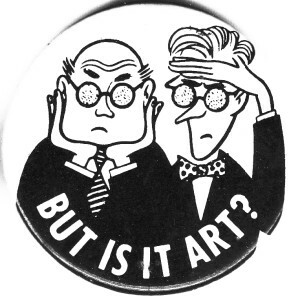 I’ve had this button since the ’80s and I still don’t know the answer. 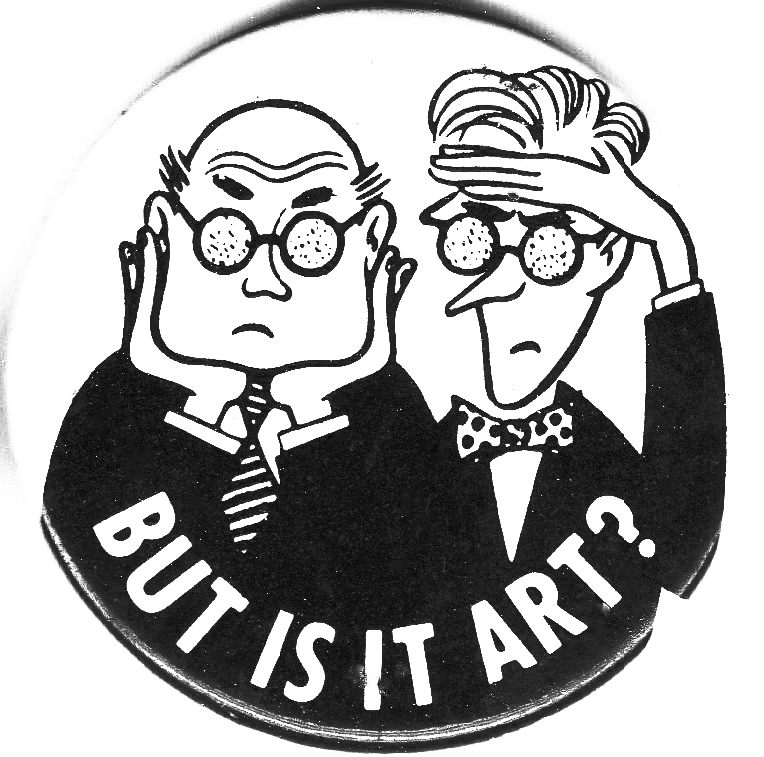 Back then, as an art-loving, art-making student, I took this question very seriously. Those two (white, male—but let’s not get into that right now) critics, although humorously drawn, were exactly the sort of gatekeepers I thought I wanted to impress. Now, not so much. Now I’m just looking for genuine connection with like-minded readers. Those are the people I want to impress. I’ll let them tell me if it’s art. It still boggles my mind that people are not only reading my debut novel, NOT ON FIRE, ONLY DYING, but that some of you have been kind enough to let me know you liked it. Some of you liked it a lot, and said so publicly, via reviews posted to Amazon and Goodreads. These reviews mean everything to me, and for reasons that have nothing to do with the aspects of book publishing I enjoy least: Marketing! Publicity! No, seeing these reviews fills me with such deeply-felt gratitude because they confirm that my writing has resonated with you. You heard music in my language. Something made you think. You wanted to know what happened next. It connected you to me, however briefly. I serve as Reviews Editor for the webjournal Necessary Fiction, so every week I read many reviews of books forthcoming from independent publishers. These are publishers taking real risks. Not burdened by the extraordinary commercial expectations that have ruined—too strong? okay, how about: damaged—so much of mainstream publishing, these small pubs fiercely support, rather than discourage, controversial form and subject matter. They embrace traditionally marginalized authors and characters. Their authors are my comrades. From tiny platforms we shout our stories into a large, noisy world. Each and every reader who shouts back in recognition is a hero, truly. So, is it art? You tell me. If you are so moved, please write as little or as much as you like about NOT ON FIRE, ONLY DYING, on Amazon, Goodreads—or, if you’re a writer who publishes book reviews, please consider submitting one to your favorite literary journal. Thank you for hearing me. Thank you for shouting back. I hear you too.